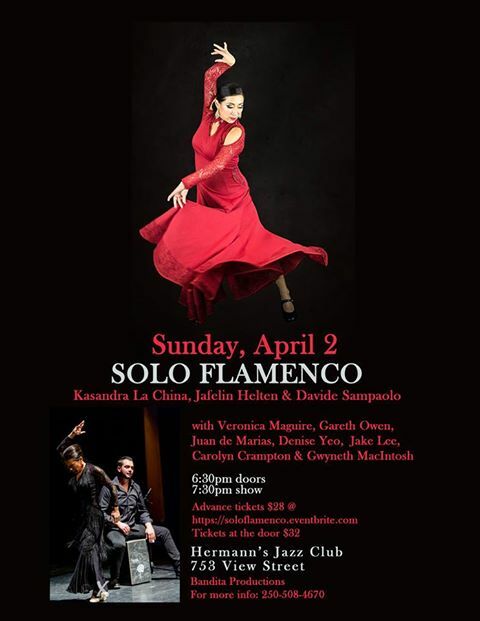 Kasandra Flamenco brings Solo Flamenco to the Island; adds in TONS of local talent; and creates a flamenco dance extravanganza!! Kasandra ‘la China’ (artistic director and lead dancer), Jafelin Helten (cante), and Davide Sampaolo (wicked percussion) are joined by local guitarists Gareth Owen and Jake Lee, singers Veronica Maguire and Juan de Marias, and an incredible line up of local dancers: Gwyneth ‘la Chispa’ McIntosh, Carolyn Crampton and Denise Yeo. Seriously – all that talent on one stage?!?! Yes! This show is priced to sell out, so get your tickets early. If you are a party of 6 or more, you can reserve a table by calling Hermann’s directly: 250-388-9166. Don’t forget to buy your tickets first.